Posted on July 16, 2011, in Uncategorized and tagged barter, bunny berries, chicken feed, compost, feed, fish feed, food, fruit, grass, healthy meat, herbs, high protein, homestead, manure, natural, natural food for rabbits, nature, pelt, plant food, red worms, safe, self sufficiency, self sustaining, tree, twigs, vegetables. Bookmark the permalink. 3 Comments. I just read your posts on The Backyard Pioneer. 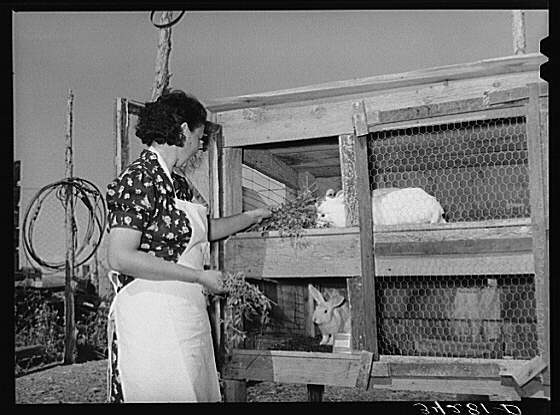 I’ve been wanting rabbits for manure, but one concern of mine is what to do when I go on vacation? Can I leave a bunch of feed? We don’t have extra money to have someone come in everyday to feed and clean the cages. Any thoughts would be appreciated. I have gone for 3 days with no problems, when free-feeding my colony of (mostly Satin) rabbits. I find they do not overeat nearly as much when they have the social interaction of colony life. 🙂 I do prefer to be around to feed them daily fresh greens in season, or root veggies or fodder in the winter, but an occasional weekend away is very doable with a colony set-up.